Sorry if I’m being late to reveal theme 05, but I’ve been very busy in the last days. Theme 05 will be “HORROR”. Do we feel at home with this theme? Yes, we could say so. Orgasmo Sonore project has already been devoted to the classic music of horror cult films over its 3 first albums. We are now well acquainted with the works Fabio Frizzi, Goblin or Stelvio Cipriani with some of the best horror film soundtracks of the 70s. But let’s try not to fall easily in the comfort zone here. What if we take this theme on a pure musical sense? What kind of music, what type of piece of music could best represent this theme “Horror”? What direction do I give to this one? There seems to be so many possibilities, not so easy finally. I sure want to avoid the use of random odd synthesizer patches, low frequency drone and loudly reverbed drums, we hear enough of this in the current uninspired style of horror soundtracks. I’d rather like to point out to the work of one particular composer that is maybe one of the most important influences of horror music, maybe you know his name, maybe not. You certainly know is music as it’s been used in important films like Exorcist and Shinning. 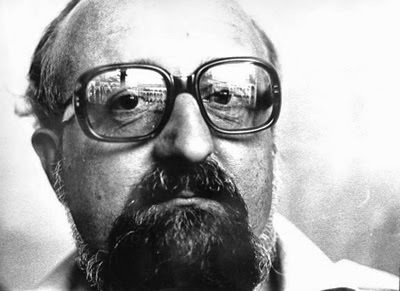 I’m talking about the Polish composer Krzysztof Penderecki. I want to immediately say that I will not compose a Penderecki-like piece of music for the theme 05. I don’t have this capacity and I’m far from his genius. But I like to root each of my themes into something specific and Penderecki deserves a mention here for his contribution to some of the most out-of-this-world music and horrifying sounds that an orchestra of classical instruments can produce, and this without the use of synthesizers or soundscaping techniques. One of his masterpieces, Threnody, was composed in 1960 and dedicated to the victim of Hiroshima. Horror of war. For this, he use very large section of strings and create wall of sounds by assigning each player on one note creating a cluster effect. Like it or not, his music never let anybody indifferent, it’s pure horror of dissonance. In the example below (video), you can follow the strange notations to see how organised his chaos was. But just replace the notation with a slightly horrific image, and you have horror power 10. Even with some of the pieces he made, and the fact many of his music was used in Exorcist and Shinning, we may overlook his real influences in the way music for horror movie is made today. Even the modern low frequency drone we hear so much in way of atmospheric climaxes may originated from the effect of his cluster strings technique. Recently, Radiohead’s Johnny Greenwood used a lot of Penderecki techniques for his score to There Will be Blood. Not necessarily a horror film, but it was a perfect score to depict the descent of one individual in some kind of hell. But OK, let’s go back to theme 05, let see what Orgasmo Sonore can do in 2 weeks with “HORROR” !